Today we are interviewing Mike Robertson, author of the self-help/motivational book The Pizza, the Peach & the Platypus. 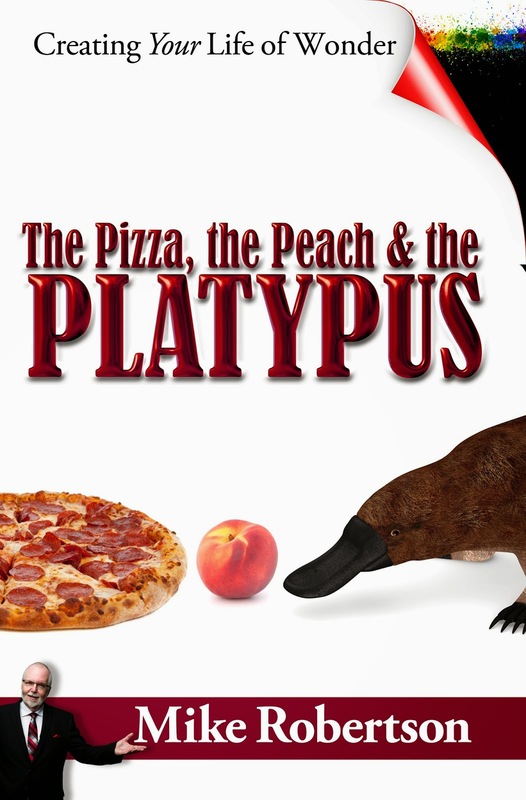 The Pizza, the Peach & the Platypus is a book on creativity, but not a dry, scholarly tome on that subject. Instead, it contains a series of personal stories from my life, showing how many different aspects of my life have been enriched by using the simple formula I include in the book. This three-part formula will show readers how to become more creative while finding new ways to use the natural talents and abilities they already have within them. Children are almost always creative thinkers, so they don’t need much encouragement in that area. As we become adults, though, we often stop dreaming. We settle into familiar routines and think that’s just the way it has to be. It does NOT have to be that way. We are the authors of our own lives and we have enormous power to change the nature and direction of our futures. I’m a professional speaker who talks to audience regularly about creativity. For several years audiences have asked if I had a book on the subject I had spoken about. So it was incumbent upon me to expand the ideas of my speech into the larger format of a book, where I could add even more stories and examples of the power of creative thinking. I wrote my first book about ten years ago, but I have not consistently written all this time. I’ve done three books now and they’re all very different from each other. But I like that. It appeals to me more than writing the same ideas over and over. Some contenders would be ‘A Prayer for Owen Meany’ by John Irving; ‘Banvard’s Folly’ by Paul Collins; Bill Bryson’s ‘One Summer: America 1927’ and ‘Outliers’ by Malcolm Gladwell. When I was young, I mostly read fiction, but now I tend to buy much more nonfiction: biographies, social science, humor, etc. I have found my own voice, which is tricky when you begin writing. It took a while before I could shake the idea that some English teacher was going to be grading my work; I was writing as though I were trying to fit someone else’s guidelines. I finally realized that I should just write something that I would enjoy reading myself. It was indeed, and I give credit to my high school English teacher. I went to a very small school and had the same teacher all four years. She was terrific, allowing us to do nontraditional things for credit and encouraging me to read and to write. I started reading ebooks on a Palm Pilot before iPhones or Kindles even existed. Now I read almost exclusively on the iPad. While I miss the twice-weekly bookstore visits I used to make, it’s great to be able to instantly download a book. And they never need dusting or cramming into an already-full bookshelf. I think I already know what my next two books will be about. I hope to write more regularly and produce a book a year. No, I like it all…I just have trouble making myself sit down to do it. Once I’m writing, I love it. Editing doesn’t bother me. And, since I have extensive graphic design experience, I can do my own interior layout and cover design. I have just about complete creative control. I only write on the computer. I don’t think I could write fast enough with pen and paper to keep up with my thoughts. Since my book is about creativity, I wanted to put a couple of little goodies inside for the wonderful people who choose to read it. There’s a bonus link in the book to a visual and audio enhancement of one very important story. And there’s also a secret message hidden inside the book, a treasure hunt that will reward observant readers with a cool little prize. My test readers have loved finding out the secret.